. . .The desert was new to me then. I had not read Pierre Loti's wonderful book, "Le Desert," and I did not see much to admire in the desolate waste lands through which we were travelling. I did not dream of the power of the desert, nor that I should ever long to see it again. But as I write, the longing possesses me, and the pictures then indelibly printed upon my mind, long forgotten amidst the scenes and events of half a lifetime, unfold themselves like a panorama before my vision and call me to come back, to look upon them once more. "The grasses failed, and then a mass Of dry red cactus ruled the land: The sun rose right above and fell, As falling molten from the skies, And no winged thing was seen to pass." Joaquin Miller. I will never complain about the heat down here again. Really enjoying this so far! What a great addition to Western-American history! I cannot recommend this highly enough to those of you interested in the "life" part of the phrase "military life." 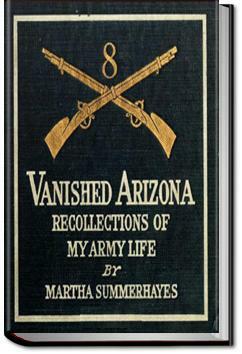 Wonderful description of life as an army wife in mid to late 1800s in Arizona. Gives a good sense of how little there was but what beauty surrounded them. Okay, it's travel for me, non-fiction or history for Sandy. Fascinating if you like books that allow you to picture how people lived in other times. Hard to imagine surviving Arizona summers not only without air-conditioners, but with corsets and petticoats. Yikes. I loved the stories of early Arizona, though I don't care for the author; too much complaining! 3.5, but Mrs. Summerhayes gets the "Beginner's Benefit."